Firms skin, boosts collagen production for a younger look. Refines texture and evens out skin tone. Our best-selling vitamin C + Firming Serum contains a 12% concentration of stabilized Vitamin C in the form of L-Ascorbic Acid. L-Ascorbic Acid is the only form of Vitamin C that is easily absorbed by the skin and is vital for collagen production. More collagen means firmer, younger-looking skin. Other products use synthetic forms of Vitamin C, such as C-esters and magnesium ascorbates which must be metabolized by the skin into L-Ascorbic Acid before being able to be absorbed. The result is a less effective product. Our elegant water-free vitamin C+ Firming serum is the foundation of any long-term, effective, anti-aging skincare routine. Packaged properly in a dark amber glass bottle, the l-ascorbic acid is suspended in a glycol base at a pH of 3.5 to improve penetration deeper into the skin. This powerful antioxidant serum protects skin cells from free radical damage due to exposure to UVA and UVB radiation, smoke, and other environmental pollutants. Free radicals damage the collagen layer leading to thin, crepe-y, brittle skin. Using our vitamin C+ Firming serum not only protects the skin from this damage but provides the L-ascorbic acid necessary for skin to replenish its collagen layer. A thicker collagen layer translates into a younger, smoother, less wrinkled complexion. Besides stimulating collagen production to firm the skin, vitamin C+ Firming serum corrects hyperpigmentation by limiting melanocyte production. Skin looks brighter and more even-toned. Skin texture is finer and younger-looking. Age spots fade away over time. Antioxidant properties have been shown to last for up to 72 hours. Use vitamin C + Firming Serum every day and look forward to firmer, brighter, more radiant-looking skin within two weeks. For normal to oily skin. Dry skin users should apply a moisturizer after applying vitamin C + Firming Serum. For complete protection from ALL free radicals, combine with CSRx Antioxidant Defense Complex. For Clinical Articles supporting the use of l-ascorbic acid (vitamin C) in skin care formulas, click here. Use after CSRx Antioxidant Defense Complex or any exfoliating product and before all other skin care products on clean, dry skin. Place 2-3 drops of the serum in the palm of your hand. Apply lightly to forehead, cheeks, chin and neck. Gently massage into skin. Use regularly once each day. Store in a cool, dry place. For dry skin users, place a few drops of Vitamin E oil with the vitamin C+ Firming serum in the palm of your hand for added moisture and antioxidant protection. To increase penetration, use an exfoliant such as Age-Limit Advanced Refinishing serum, CSRx Polishing Grains or Ultra-Gentle Surface Peel before applying vitamin C+ Firming serum. Using vitamin C+ Firming serum each morning and Age-Limit Advanced Refinishing serum each night will help to brighten skin tone and improve skin texture is as little as two weeks. Hyperpigmentation and age spots will fade within six weeks when used with a proper sunscreen. See Dr. GlowGirls’s Sunscreen Blog for product recommendations. Use CSRx Antioxidant Defense Complex before vitamin C+ Firming serum to protect from ALL free radicals. Apply CSRx Antioxidant Defense Complex first then follow with vitamin C+ Firming serum. Combine with Stress Recovery Complex to deliver the ultimate knock-out punch to premature aging caused by stress! Apply vitamin C+ Firming serum first then follow with Stress Recovery Complex. Patricia suggested Vitamin C+ Firming serum for me. I am 84. I did not expect a visual change however the C and SuperMax peptide serum are a MUST for aging skin. Thank you so much for these great products. I have used other serums also but I LOVE these! Vitamin C+ Firming serum is the best product! It makes my skin glow. I am always looking for products to help hydrate and make my skin glow. Thanks so much! I love the vitamin C+ Firming serum because it lessens my facial spots and makes my skin moist and clear. Got my husband using it and he won’t travel without it. It’s also a great value and an easy traveling bottle as it stays nice and snug without leakage like other products. Been using it for years! I have been using C+ Firming Serum for at least 10 years now. I will never stop. I am a skincare junkie and if there was only one product that I could have for the rest of my life, it would be Cellular Skin RX C+Firming Serum. I have told other discriminating people about it and they agree! It has kept photo-aging (brown spots & patches from sun damage) away like nothing else. It significantly smooths my complexion and if I stop using it, it’s obvious. This product has provided long term lasting benefits improving the condition of my skin. I am 59 and I am constantly told that I appear to be in my forties. I’m good with that! Thank you for making this incredible product!!! C+ Firming serum. I’ve used this for a while and then other brands, but I always come back to this. I want to age gracefully with great skin. So far so good- people say my skin glows. C+ Firming serum spreads really well unlike some other Vit C’s which are more watery and can dry me out. I’ll use this on my neck and decollete and if there’s a line on my chest, it instantly smooths out, which is amazing. Great product, great price and value. I have been using the skin care products from Cellular Skin RX for about three years now. I get compliments quite a lot on how young I look and how flawless my skin is! I am 53 and that means a lot to me! My favorite is the C+ Firming Serum because it fights free radicals and I started noticing a difference in my skin within a week…my skin looked healthier and fresher. It glowed! I love all of my Cellular Skin RX products! Thank you! I love this stuff! Makes my skin look healthier and glowing. I don’t have anything to say much but I just LOVE! the Vitamin C+ Firming serum!!!! It works within just a few days! I have been suffering from acne scars and freckles and blemishes from the sun since I never put on my sunscreen being afraid since it always clogs my pores and makes my pimples worse. Recently my acne just disappeared and so now I start getting rid of the scars and putting on sunscreen. I use a lot of other products that are popular, about 7 products each day and night but it just improves slowly. When I tried this, I see significant result in 3 days and I love it ! Thank you!!!!! I will pass this on ! I love C+ Firming serum because when I looked weary with bad skin condition, I tried many products but useless. Finally, C+ Firming serum saves me. It makes me glow again. Almost ten years ago I started using C+ Firming serum and I never stopped. And now I still look like the same as almost ten years ago!Thank you CSRx. I came across this brand by chance on the web while searching for a good Vitamin C serum years back. Since than I’ve been a fan of Cellular Skin Rx Vitamin C+ Firming serum and their many other products. I also highly recommend the SuperMax MultiPeptide Skin Solution Serum and the ProgeniDerm Anti-Senescence Skin Stem Cell Serum. Turning 40 this year is just a number to me, my skin is well-maintained by Cellular Skin Rx products. Also the service provided by Ms Patricia is ideal. She has been very helpful. Love love love C+ Firming Serum. My absolute favorite product for several years (and now I add a drop of Antioxidant to it, which boosts the whole experience – love that idea). The one compliment I hear regularly is on my skin. “Glowing”. “Fresh”. “Beautiful”. No one believes my age! And I truly feel fortunate to have heard of this product, because it is completely affordable and never lets me down. I can’t say enough good things about Cellular Skin Prescriptions! And their customer service is outstanding! I’m so so impressed with all my Cellular Skin Rx products! When they say “products with Active Ingredients that Work” well nothing could be more true!! !I’ve been using the Relax-A-Line, Vitamin C+ Firming Serum and the CSRx Polishing Grains for almost 4 years now. This combination of products has brightened my skin and removed any brown patches I used to have. It’s also kept my skin clear because when I first started using the products I had the occasional monthly break out. My skin is flawless and poreless now! I never imagined at 54 years old I would have so few lines and such a perfectly even skin tone! I’m getting compliments daily! Thank you Cellular Skin Rx!! Wouldn’t want to go a day without you! I have been using C+ Firming serum for ten years now. The texture, color, and firmness of my skin is excellent. I get compliments on my skin regularly and I’m in my early 50’s. The serum is not sticky and a little bit goes a long, long way. It dries quickly and doesn’t interfere with my make-up at all. Best of all, it works! I just wanted you to know I reviewed your Vitamin C serum on my blog. I’m a fan from over 4 years ago, and wanted to share my love! You’ve always been great to deal with too, so it was nice to spread the word about your product. https://culturedchaosmelbournemum.blogspot.com.au/2014/08/review-cellular-skin-rx-c-firming-serum.html. I linked you on Facebook too. I remember the first time I used vitamin C+ Firming serum. It was a sample that I got when ordering my very first order ever which was Relax-A-Line. I got some redness at first so I stopped using the product. You said this is normal. I started again. NOW, you would have to hold me at gunpoint to stop me from using C+ Firming serum!! I know it is one of the best products for my face and I use it religiously. I cannot thank you enough for always taking the time to explain your products, with the trials and proof to back it up! Thanks for being there, and making great products! I have been a faithful user of Vitamin C+ Firming Serum for the last 4 plus years and going. I was diagnosed with a medical condition known as “facial neuralgia” 22 years ago involving the right side of my face. The condition causes weakening of an individual’s facial muscles over time. About 6 years ago, I began to notice facial sagging below my eye and upper check area. I tried numerous products over time, but all failed. During one of my searches, I saw this product on the Cellular Skin Rx website and it’s advertised promises. I placed an order to give the product a try. I used Vitamin C+ Firming Serum as indicated. After continuous use for almost 6 months, my facial sagging began to diminish. It’s remarkable how the product has changed my total well being. With a limited income, it’s been hard for me to reorder sometime when needed to keep my accomplished success on-going; I just pray I can continue to be a user of Vitamin C+ Firming Serum. >Thank you Cellular Skin Rx for changing my life. I’m a 61 year old with large pores and normal to oily skin. I live in Florida and have brown spots from sun damage on my face and neck. While visiting a friend in Denver, Colorado I noticed her glowing, clear skin and asked what her secret was. She replied that she uses Cellular Skin Rx C+ Firming Serum on her face every morning and it has made a great difference in her skin tone and texture. Her dermatologist recommended this product due to the high concentration of stabilized vitamin C. The dark glass bottle protects the product. I used her product during the visit and ordered my own bottle when I returned home. Now I’m a dedicated user as well. Every morning, following cleansing and toning, I put 3-4 drops into my palm. I put my palms together and turn my hands back and forth a couple of times to distribute the drops to both palms. Then I pat the product on my face and neck, gently pressing until it’s well distributed. I allow to dry for a few minutes then continue with my makeup primer. Here in humid Florida, I don’t need additional moisturizer during the daytime. I think my brown spots have lightened since I started using this serum and I love the texture of my skin! I highly recommend Cellular Skin Rx C+ Firming Serum. I’ve been using the vitamin C+ Firming Serum 2 years now. This is an amazing product for me. It made my skin very soft and supple, reduced the appearance of fine lines and frown lines between the brows. I also have been trying the Age Limit Advanced Refinishing serum. I really like it. My face looks more even toned and somewhat brighter. I seldom take the time to review products, however, I am taking the time to share my testimony about the Celluar Skin RX formula C+ Firming Serum. I’ve been using this product each morning for several months, and it has become my favorite skincare ritual. I only need to apply 3-4 drops for an allover face application, so the formula lasts a long time! 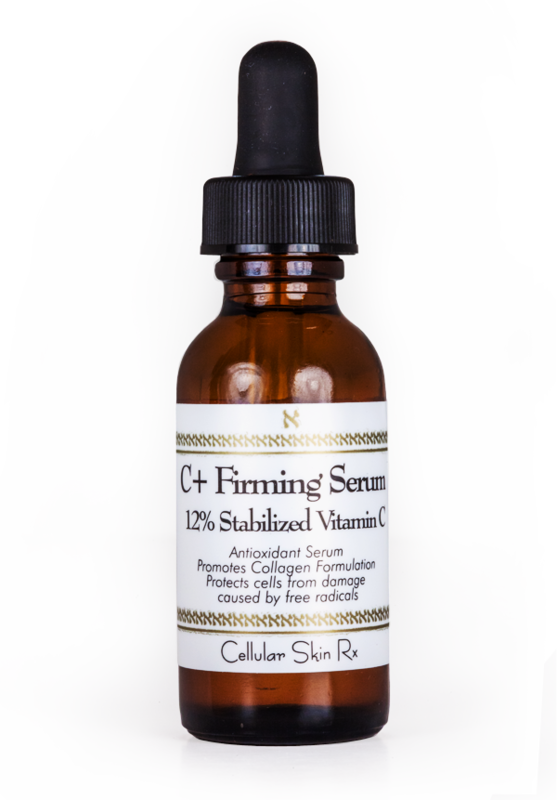 I love the fact that C+ Firming Serum has stabilized Vitamin C, so I trust the potency of this firming and antioxidant formula! It goes on easily, smoothing, firming and protecting my skin – and a testimony, yes, my skin does glow, and at 50 years old, I have to say I’m very pleased with my skin’s appearance! Thank you, Cellular Skin RX for an awesome and affordable product – you can count on me as a continued repeat customer! Happy 10th Anniversary! My favorite product in the Cellular Skin RX range is the Vitamin C+ Firming serum. I have used this product for many years and I always have it in my cosmetic kit even when I am traveling and have to squeeze my creams and gels in a small baggie. After I put the serum on my face, it immediately glows as if it’s lighted from within, my skin gets a pleasant and healthy shine not the kind that you want to put powder and concealer on. I haven’t used powder and concealer since I started using the products from Cellular Skin Rx. When I abuse my skin with long periods in the sun, the first thing I do when I get in the bathroom is wash my face and apply Vitamin C+ Firming serum. I trust it to protect me and repair the damage from the sun. I also use it because it makes my skin soft (sometimes I don’t even apply moisturizer), it smoothes out fine wrinkles and makes my skin plump up from within. I love this product. Maybe I made a mistake ordering your unique and potent C+ firming serum; It is too much like an angelic serum; And I’m no angel; But this wonder serum is too good to be true; Is this a gimmick or trick, that this serum works so well on my face and I wonder why; How could you market such a wonder serum; a panacea of delight. It absorbs into my skin like my skin pores crave its ingredients. This product should never have come out; What a find! Went to a dermatologist and he recommended Vitamin C serum at an ungodly price and then discovered your web site. Clearly the most remarkable product I have purchased. As a 62 year old male it truly does smooth out my skin and makes me look younger. Rememeber this is from a guy talking about face stuff…………..
Hi, I’ve just made an order – 2 of my favourite products – Vitamin C+ Firming serum and Eye Bright Treatment serum. I just wanted to post some comments about these products. Your company alone has managed to help me get rid of all my (facial) skin problem areas – not only does my skin now look bright, shining and healthy, I also don’t have any more of those unflattering bags under my eyes (and I have been seeking solutions for a long time! ), I also dont’t have any more frown lines on my forehead (so no need to resort to injections). I don’t normally do this but I’m so in love with your products so please feel free to publish this feedback. Oh, and customer service is always excellent. Hands down my favorite product is the lovely Vitamin C serum. I have lost track of how many times I have ordered this. It makes my skin glow and look so healthy. I have tried others, but nothing else works as well on my face. I love it! Just a note to let you know that I began using your C+ firming serum years ago, when you first launched your products in 2004. I have have tried most all of your other products. I use most of them on a regular basis. I get so many complements on my skin and I am confident it is due to Cellular Skin Rx products. I am a flight attendant and the air on the plane is harsh on the skin and I feel all the products I use on a daily basis help keep my skin in the best condition possible. I love the Firming Peptide Eye Creme, the Intensive Eye Therapy Creme and the SuperMax MultiPeptide serum. But what brought me to your product line is the C+ firming serum and I would not miss a day without it. I thank you for your products and appreciate your dedication to product quality. Hi – I just wanted to let you know how much I appreciate your swift service. within a week: I’m in Europe. Thanks also for the generous sample of another product. Add our new Retinol Peptide Resurfacing Complex to your Vitamin C+ Firming purchase for only $45! You save $20! Use Coupon Code ADDRET45 at checkout. Sorry! Cannot be combined with other coupon codes. Limit one per purchase.